Israel’s own version of Barack Obama and Jimmy Carter combined into one, Shimon Peres, is even worse than many of the Obamessiah worshippers on U.S. soil in gushing over today’s Nobel Peace Prize to Obama. 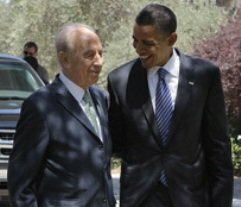 Peres, who basically destroyed Israel and yet has 109 lives in Israeli politics, is the man behind the disastrous Oslo Accords, the “Road Map,” and the “two-state solution” and other measures that have given Islamic terrorists multiple orgasms over the past two decades. For those deeds, Peres was awarded his own Nobel. Alas, this [Obama’s Nobel] is likely to lead to the same outcome as his own Nobel. As you know, Israel suffered terrorist attacks galore and continues to self amputate parts of the country to give to the Islamic terrorists who foment the attacks. All of this happened after–and as a result of–Peres’ stupid Oslo Accord, for which he got the Nobel. Someone is going to win this dog fight — Usually, the winner is the dog who gets fed the most. Alas, it looks like the red dog is getting most of the food now. God have mercy on us. This world of ours is just continuously becoming more bizarre and twisted by the day. The Nobel Prize awards have long lost any credibility that they may have had in the past, but Obamy being awarded nearly made my head explode. Rather than see these career politicians for what they truly are, instead we hand them awards, unbelievable and Obamy,? Along with Carter he will be recognized (by those that live in reality) as the most useless, ineffective, deceitful , oh jeez there’s just not enough time to complete the list. What a farce. Take care all…..Love This Site!!! I believe Glorious Leader was awarded the Nobel Peace Prize for his historic Beer Summit, wherein he brought forth peace between the Races for now and evermore. Glorious, Glorious, Glorious is our Leader! I will celebrate his Nobel Prize with a Bud Light! Obama obviosly earned it. Nominations closed February 1, 2009 for this prize, Obama had been in office exactly 12 days and must have stopped several wars already? I guess that’s why he won it. Peres is a friend of Tiki Barber, former Giants great running back now working for leftist NBC. I laughed at Peres’ sycophantic diatribe, but it is depressing actually. I think even Kim Jong Il would be slightly embarassed if he heard something similar about him on North Korean TV. Will they promote Tiki Barber to military/political analyst? Peres didn’t really kill Israel…he just gave it a castration and cut a few limbs here and there. It took Olmert and Livni to perform the botched heart and lung surgeries and then leave the instruments inside after sowing up the body. I loathe Peres. He makes Jimmy Carter look competent. There is nothing wrong with anyone winning the Nobel peace prize. Peres got it to bring peace to Hezbollah and not Israel. Obama got it to bring peace to the Muslim world and not America. What is wrong with that? I am just wondering. I forgot to mention that both of them and others encouraged, encouraging and forming what Debbie always says “the religion of pieces”. Attacking the president for winning the Nobel Peace Prize puts you squarely on the side of the Taleban, You missed a golden opportunity to be patriotic. Most Israelis loathe Peres – he must be the most disrespected politician in the country, exception made for Olmert. Whenever there is a newspaper article re: Peres, the talkbacks & comments are 99% negative. There was a poll not long ago, the question, who was the most destructive political figure in Israel & guess who won? You forgot another Jew that got the Peace Prize. You are no patriot if you give obummer any type of kudos, the word dumbass is coming to mind. If anybody here thinks that there will be peace between Israel and the effing savages, you are completely deluded. The only peace you will have is if Israel does a Gen. William T Sherman on them. Debbie, doesn’t Hussein and his rise to power remind you of Sam Neill’s portrayal of Damien Thorne in the Omen III? Very similar bogus awards used to happen during the reign of Nero. The Nero/Obama parallels are starting to add up. Really! You could have stated your ideas better than you did. Multiple Orgasms, has nothing to do with Palestinian & Israeli Poliltics. It’s just plain weird to have read such nonsense! While you are right about Perez, the way you wrote about the Middle East, was going good, until your odd analogy. Rethink your words, and do better. “Every Idol Word” God will hold us accountable for. Fantastic Points Altogether, You Just Gained A New Reader. sbobet What Would You Recommend About Your Post That You Made Some Days Ago? Any Positive?